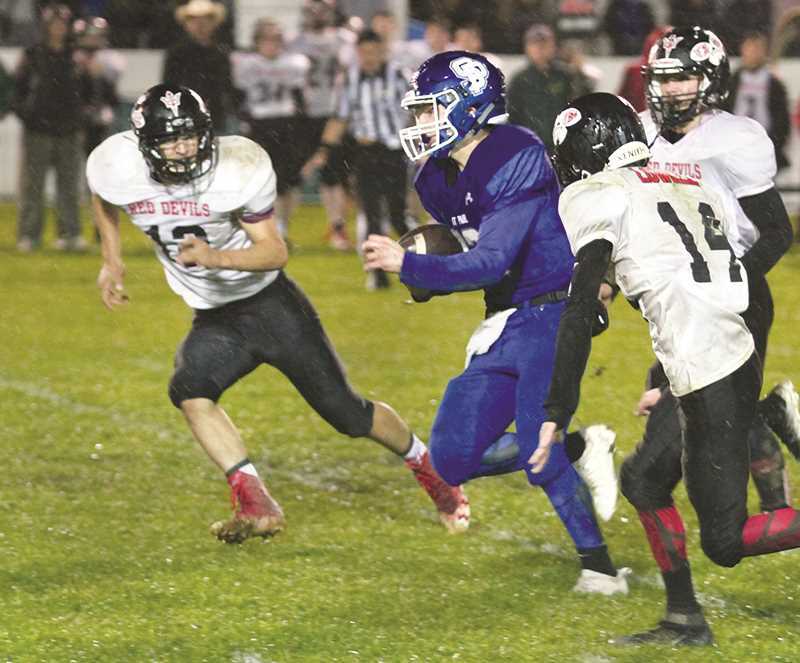 The two teams entered the rodeo grounds looking to come away with the league's top playoff berth and bragging rights heading into the 1A state tournament this week, but it took all of one quarter for the No. 3 Buckaroos (9-0, 6-0 SD1) to prove they were a class above the No. 7 Devils (6-3, 5-1). From the moment Lowell snapped the ball out of its own end zone for a safety on the first drive of the game, the Bucks were in control, scoring six consecutive touchdowns to take a 46-0 lead after the opening quarter. The rain proved to be a significant factor in the victory, causing the already elusive St. Paul running backs to become that much more difficult to take down and making the ball difficult to hold onto for Lowell. In addition to the safety, Lowell coughed up five fumbles, four of which were recovered by St. Paul. The first fumble came less than four minutes into the first quarter, with the Bucks leading 10-0. St. Paul's T.J. Crawford took the next play 23 yards to the end zone for his second touchdown of the night. On its next drive, Lowell fumbled again and the ball was battered back 10 yards, which allowed the Bucks' Justin Herberger to scoop it up and dive into the end zone for another score, making it 24-0. Facing an early deficit, the Devils turned to the air toward the end of the quarter and were once again stymied by the Bucks. Crawford picked off a pass with 3:32 remaining, leading to a 19-yard touchdown run by Herberger on the ensuing drive. Lowell tried again on their next possession, but was picked off by Alex Dela Cerda, who returned the ball 39 yards for a touchdown, putting the Buckaroos up by 46 to end the quarter. The Devils got their lone break on a 48-yard touchdown run in the second quarter to make it 46-6 heading into the break. In the second half St. Paul's reserves put up 30 points on four touchdowns to add the finishing touches to a perfect regular season and send the Bucks into the state playoffs with their biggest margin of victory yet. In total, St. Paul racked up 385 yards on the ground, led by Herberger, who went for 83 yards and two touchdowns on nine carries. Crawford finished with 68 yards on two carries, both of which went for scores. Jaden Thompson added a 68-yard touchdown in the second half, and Efrain Ramirez had three carries for 43 yards and two scores of his own. The Bucks turn their attention to the first round of the state playoffs, where they will host the Elgin Huskies (5-4, 3-3 Special District 3) Friday at 7 p.m. at the rodeo grounds.